“Every time he sees the doctors and nurses approaching him, Hari starts wailing. For the last three months, he has been getting multiple injections and his body is in constant pain. I look at him and tears roll out of my eyes. Only if there was something I could do about it,” Srividya, mother of 1-year-old Harinarayan said. 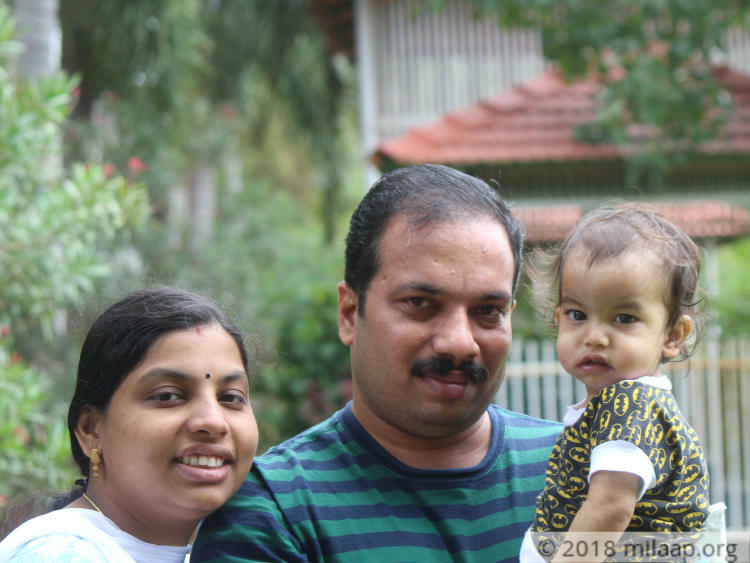 Srividya, Anoop, and their little daughter Lakshmi were thrilled to have Hari into their lives. But their happiness was short lived. 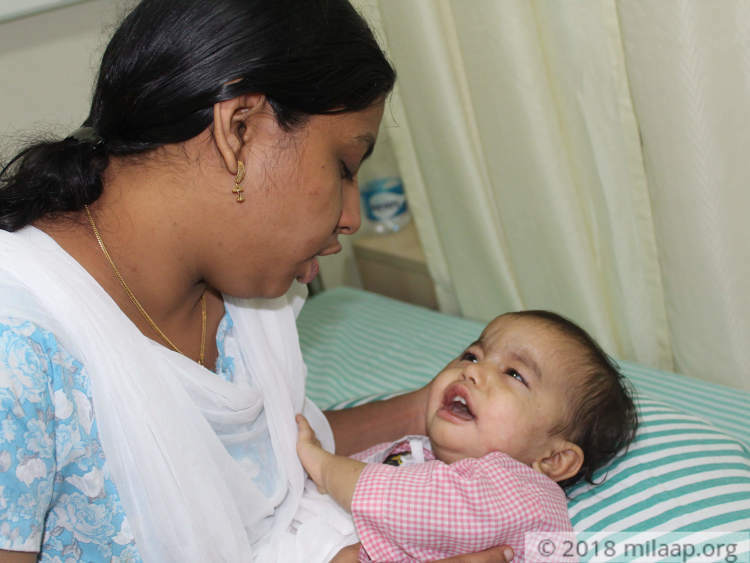 Since he turned 6 months, Harinarayan has been going through numerous tests and injections. 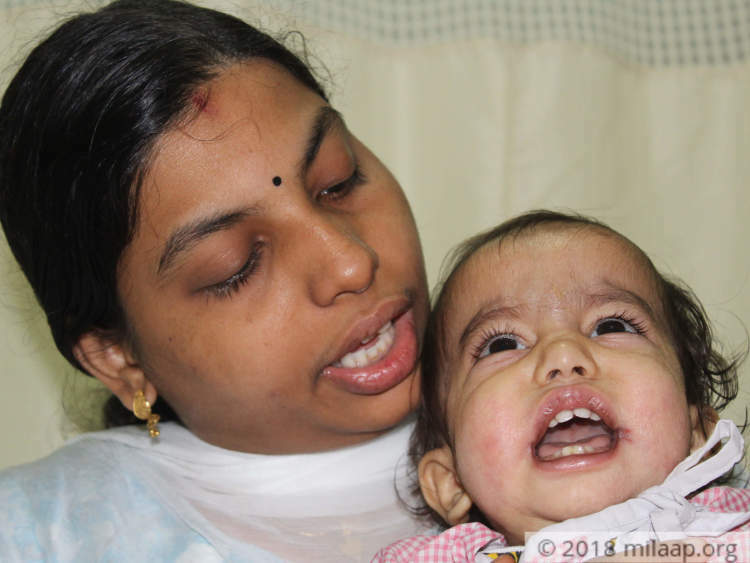 Hari’s fever spiked up and his parents decided to take him to a hospital in Kerala. “He was a healthy child when he was born, there were no complications at all. Hari loved playing with his sister, his giggles filled up our house. 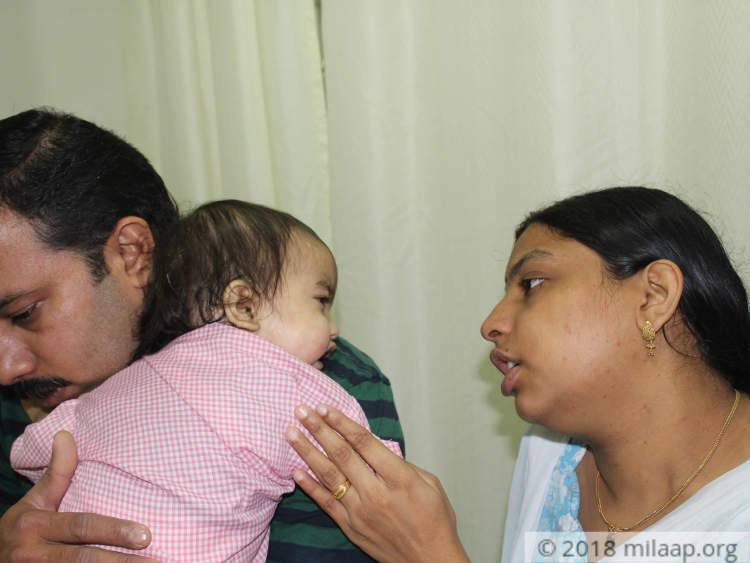 Never in my wildest dreams could I think that my Hari would be affected by something so serious, weekly visits to the doctor became the norm as every other day, he suffered from fever, cough, and cold," said Srividya. 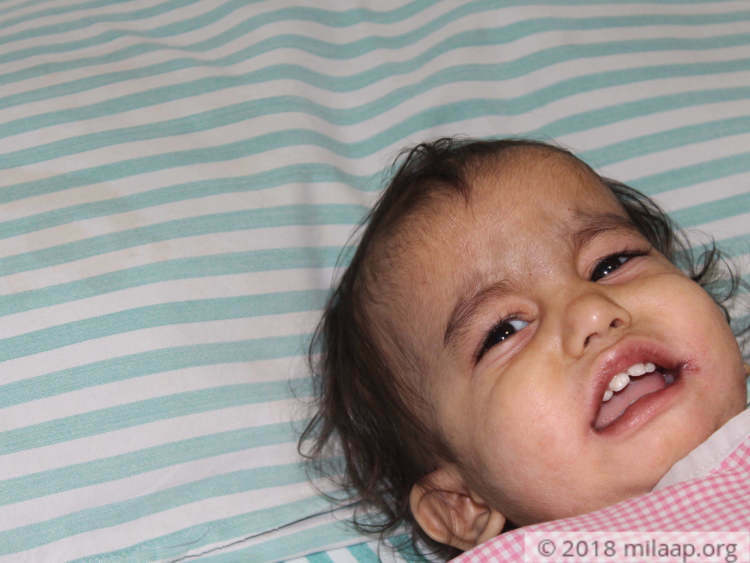 Hari has been diagnosed with a rare form of the disease, Wiskott Aldrich Syndrome. It is a rare X-linked recessive disease characterized by eczema, low platelet count, immune deficiency, and bloody diarrhea. Little Hari is restless the entire day. He is scared of the hospital and does not want to stay without his mother. His entire body aches, he never seems to recover from a cough and cold and he weighs just 7 kgs although he is 1-year-old. Hari’s disease has stunted his growth as well; he can hardly sit up straight. “He scratches himself throughout the day, it increases during the night and nothing can put him to sleep. We watch on helplessly as blood oozes out of his scabs.” Srividya explained. Anoop and Srividya have left their home in Kerala and are putting up at a distant relative's place. Every day is a struggle for these parents who fear losing little Hari if he does not get a bone marrow transplant within a few weeks. “Everyday Hari suffers so much and there’s nothing that we can do to ease his pain. Only an urgent bone marrow transplant can help us save our child. With the salary of an electric technician, I am not in a position to do anything for Hari and that makes me even more helpless.” said Anoop. The doctors have suggested a chemotherapy for Hari so as to prepare his body and to prevent any rejection of the bone marrow. The medicines are all being imported from abroad and are very expensive. They are completely out of reach for Srividya and Anoop. 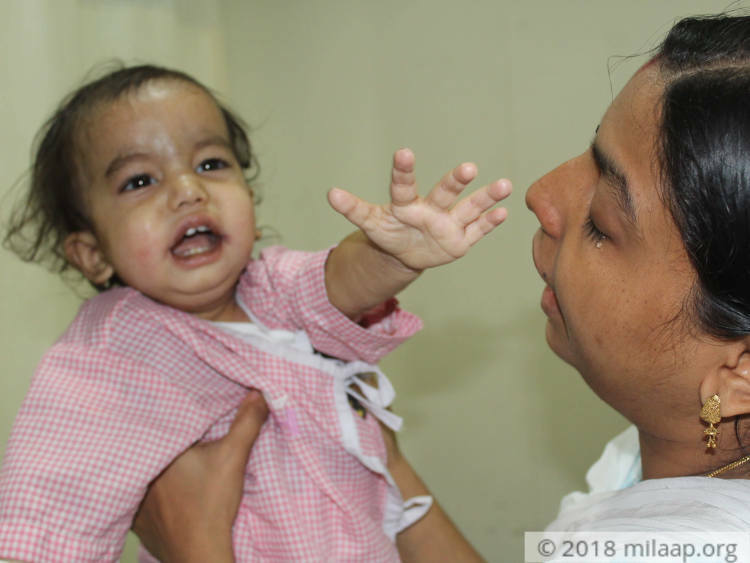 1-year-old Hari has Wiskott Aldrich Syndrome, a rare disease because of which he has severe skin rashes, low immunity, high fever and bloody diarrhea. 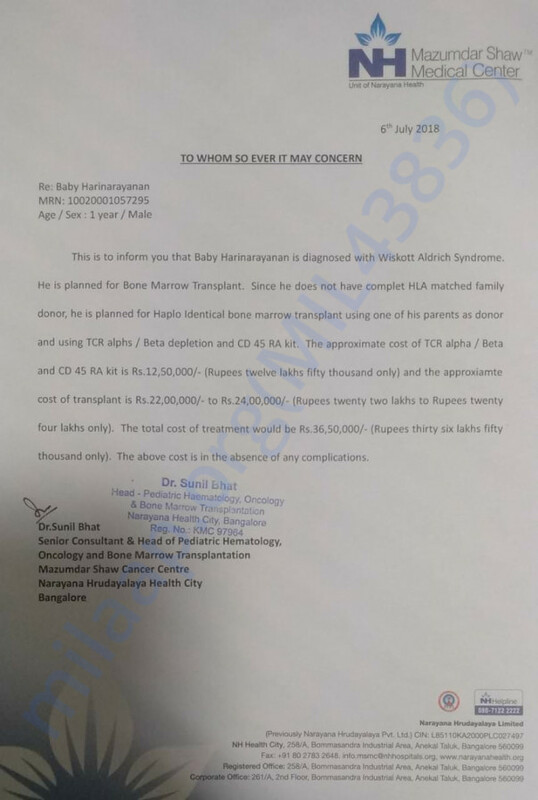 His parents have spent 1-2 lakhs already on his treatment so far and can't afford 36 lakhs. 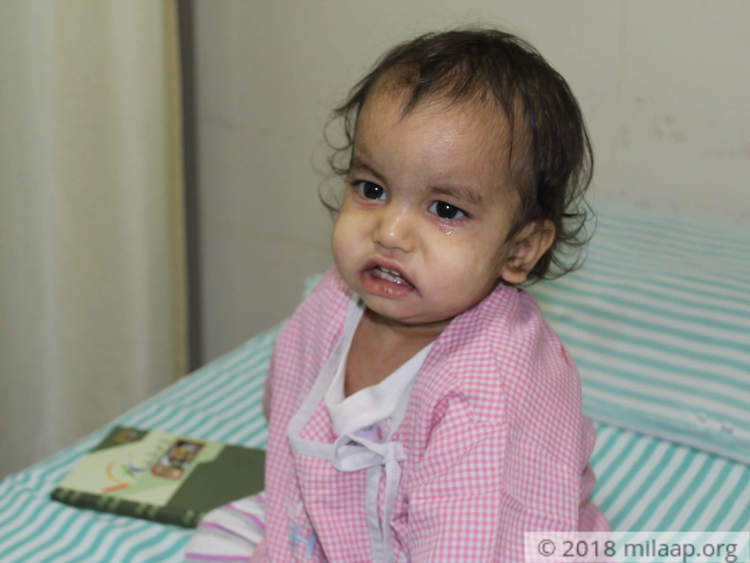 Hari has only a month to get a bone marrow transplant and it is only through your help that he can go back home, play with his sister Lakshmi and lead a healthy life. I am humbled with the love and support given to my son Harinarayanan. I would like to inform you that he underwent his Bone Marrow Transplant successfully. Presently he is being treated with medicines and will be in the hospital for a while. There are side effects such as loose motion an rashes. He has not been eating properly also. Please continue to pray for his good health and share the campaign. a heartfelt thank you to all of you for the love and support blessed on him. Will keep you posted. Thank you for the love and support. Here is a quick update on Baby Hari's health. Currently, he is at the hospital and undergoing his second cycle of chemotherapy. He will be discharged by end of this week. He still has to undergo one more cycle of chemotherapy, doctors will be able to decide the future course of action accordingly. Please pray for his health and speedy recovery, will keep you posted as his health progresses.